I was reminded of this poem, and Wallace Stevens in general, while writing about the 20 most anthologized modern American poems recently. It’s odd that I needed to be reminded of Stevens. His poems were always present in the anthologies of my school years, back in the last century, along with Frost (who I disliked when I was young), William Carlos Williams (who I didn’t understand), and Eliot (who I liked for his verbal music without much understanding). There must have been something about Stevens that attracted me, as when I recall the poems I wrote in my youth, they more often looked and sounded like Stevens than those others. There’s a wit of a very contrarian kind that’s all over Stevens’ work, so I’m sure that was a big part of it, but I think it was also Stevens’ verbal music that pulled me in, and unlike Eliot’s, I (subconsciously) imitated Stevens. I later read that Stevens walked to his famously conventional job as an insurance executive every day, and composed his poems in his head as he walked. This makes sense, as I did the same thing, with the two-footed meter of walking informing the rhythm from the soles of the feet up, rather than from the head down. Another thing about writing while walking: the music of that rhythm carries you into a more hypnotic and subconscious space were lines that sound good and fit to the beat are carried and held into memory more than carefully considered phrases that one would compose at the keyboard or with thoughtful pen in hand—and that same flow can knit together the unlike before thought can reject it. If you take Stevens’ particular perverse wit, and meld it with composition of poems while walking, you have the recipe for a Wallace Stevens poem like this one. The title of “The Emperor of Ice-Cream” has that impish quality. It seems to be light-hearted. Who’s his consort, the Dairy Queen? Is his uncle the King of Burgers? Did he know Prince? Queen Be? Duke, Duke, Duke, Duke of Gelato. And the poem starts off as if we are in a variation of the nursery rhyme “Old King Cole, he was a merry old soul” by calling for the strongest man to crank the ice cream maker. A digression: do 21st Century people even know what an ice-cream maker is? It’s a bucket, no larger than one used to mop the floor, filled with ice that surrounds a smaller metal canister with a hand-crank-driven paddle screwed into the top. Salt is poured onto the ice, melting it so that it can get the canister colder than zero centigrade, as the crank is turned to churn the mixture of sugar and cream. As the process continues, the contents of the canister thickens and the force needed to turn the paddle increases. 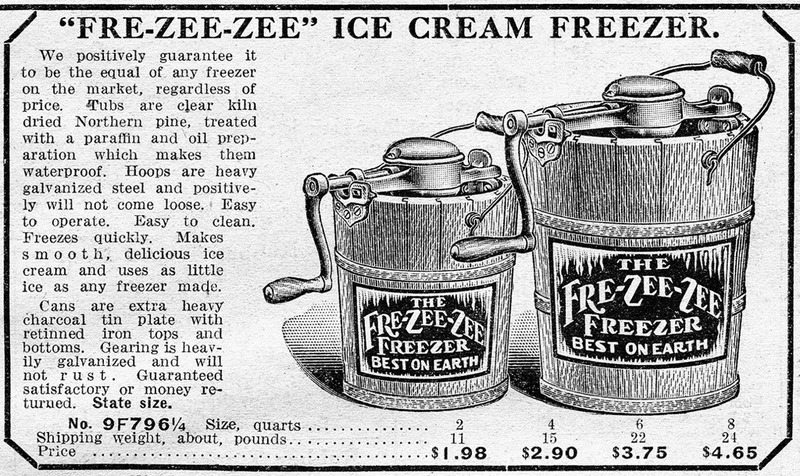 Even with a strong man cranking, the resulting ice cream will be softer than the concrete brick of modern ice cream, as that is a creature of refrigeration unknown in Stevens’ youth; but the cool, rich, sweet taste would also be all the rarer then too. So back to the poem. We have the strong cigar-maker man churning, amidst young, common, unmarried women and boys bringing flowers. The resulting ice cream demonstrates Stevens comically expanded vocabulary, it’s “concupiscent,” lustfully good! Freud may have famously insisted that “a cigar is sometimes just a cigar,” but a multitude of Blues metaphors contemporary to Stevens would agree, this is a lusty scene. And the title reappears. Pleasure, broadly drawn, is the ruler of all! So far Stevens has only been perverse in the weird “Old King Cole” language of the revelry, capped off with a word that most of us can’t even pronounce, much less spell or define. Bang! Into the next stanza. I had always thought “dresser of deal” was flowery poetic diction for “we need to deal with” the situation in this next scene, but it’s more of Stevens’ vocabulary quiz. “Deal” is an archaic term for cheap pine wood. The exquisite detail of the missing drawer pulls, so much like the shabby second-hand dressers of the bedrooms of my pre-IKEA youth, yields to the fullness of the scene: it’s a room with a dead body. Back to the solemn dead body, cold and dumb, being covered with a sheet from the dresser of deal that is poignantly too short to cover the feet. Stevens leaves the light on, we need to see this clearly. And the title returns, now a refrain, and in this new context, the ruler of all offers only fleeting pleasures that one strives for, passes through, and melts away. The poem ends. Stevens arrives at the insurance company offices. He strolls in past the receptionist, arrives at his office. Warren G. Harding is President. He asks his secretary to take this dictation. Obedient to her accustomed role, she folds back the steno pad, pencil in hand. Did she care for his poetry that she transcribed? That would be immaterial, she has only to listen. 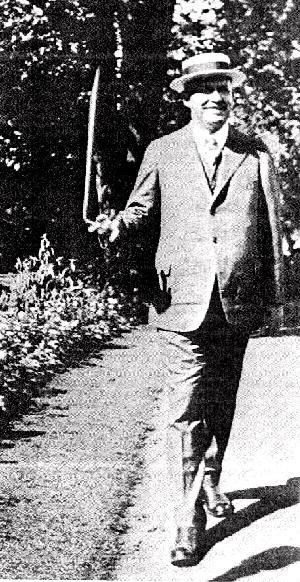 Strolling Wallace Stevens in the 1920s. Cane in one hand, thesaurus in the other? Two scenes. Two passing stations on a walk perhaps, or a flight of memories as lines emerge along steps. Only one more perversity to note, a puzzling line that looks like a typo: “Let be be finale of seem.” Let the steps the author is taking when he wrote this be our guide. One stride: “Let be”, then a double-time step: “be finale,” another step: “of seem.” I had never figured this line out, but someone on the Internet named Daniel E. Burke pointed me to this letter Stevens wrote in 1939. If Stevens had caught a crack in the sidewalk causing a hitch in his step, the line might have been more clearly composed as “Let being be the finale of seem,” but the Hartford sidewalks were too-well maintained, and Stevens never cared to be understood anyway, only listened to. I had meant to write more about the music I composed for this one, but I’ve run way too long again. I wanted prominent drums to represent the flow of time, a cello to represent the melancholy death thread and a jaunty acoustic guitar part representing the swiving partiers of the first part. Assessing the performance I first thought I should redo or remix it to keep the cello and the guitar to their respective stanzas, but then I rethought that too. Shouldn’t they both be present in each scene to give the flavor of Stevens’ perverse combination? To hear my performance of “The Emperor of Ice-Cream” use the player below.